I had such a good experience with Globalplacement. The account manager Andre offered good, service with polite and encouraging manners as well as quick update. most importantly, even though I happened to find my suitable internship by myself prior to Globalplacement, my deposit € 250 was fully returned. 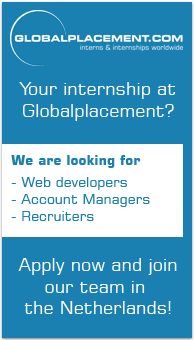 But thanks for globalplacement, I'll definitely suggest my friends to join the personal mediation program for who has trouble finding internships. Copyright © 2019 Europlacement . All rights reserved.